Bernardo Atxaga is an author from the Basque Country in Northern Spain, who writes in Euskera (Basque) and Spanish. Seven Houses in France was written in his mother-tongue and translated into Spanish under his supervision, and then into English. This double translation doesn’t seem to show, perhaps because the translator is Margaret Jull Costa – who has translated the most notable of Iberian authors, including the Nobel Prize winning José Saramago. She has captured Atxaga’s ironies perfectly. The blurb on the back cover of this novel includes a reference to Joseph Conrad’s Heart of Darkness and there are some superficial similarities. Seven Houses in France is set in the remote reaches of the Congo River in the days of colonialism, and there is likewise a character whose arrival upsets the established order of things. In Heart of Darkness Conrad redefined what savagery was for the 20th century with the swirling mists of uncertainty and moral confusion in Marlow’s search for Mr Kurtz, and Atxaga’s novel shows us who the real savages are too. The difference between them is that Conrad was a citizen of Imperialist Britain observing the effects of colonialism. Atxaga, a Basque nationalist, identifies with the perspective of a subject people. Seven Houses in France is a satire, and in this novel, there is always a sense that the colonisers will eventually get their just desserts. I learned a little bit about the Basque country before I visited San Sebastian (Donostia) and Bilbao in 2010. Basque people in parts of north-central Spain and south-western France have at different times in their history agitated (most recently through ETA terrorism) for independence. Tourists are advised not to start conversations about the Spanish football team, not to wear ‘I love Spain’ t-shirts, and not to overdo speaking Spanish, (sins I would have been unlikely to commit even without the warning). We had a wonderful time and experienced first hand the kindness of a true ambassador for his people, a Euskaldunak (native speaker of Basque language), but as we travelled further into Spain we began to understand a little of the resentment Basques feel. Their culture is quite different. Atxaga’s choice of Euskera to write his novels is a political act. It identifies him as a Basque nationalist because the language was suppressed under Franco and was only kept alive in underground schools. But even the title, Seven Houses in France is significant. The novel centres around the garrison of Yangambi in the Belgian Congo under the command of Captain Lalande Biran in 1903. He is there, long past his use-by date, because his wife Christine has the ambition to own seven houses in France, and Biran’s sidelines – smuggling mahogany and ivory – are to pay for the seventh house. Christine is Belgian, but she has a dual role in this novel. On the one hand she represents the greed of colonisers far away who have no idea of the destructiveness of their policies, but on the other hand Atxaga is making a quixotic insider’s-joke: she’s emblematic of Basque culture, where women rule the roost in matters of domestic economy! There are more ironies in the choice of the Belgian Congo for the setting. Like Basque Country, Belgium itself is a country whose borders straddle cultural boundaries. It achieved its independence from the Netherlands in 1830, and promptly set about acquiring some colonies of its own. In the novel there is great excitement over news of an impending Belgian royal visit to the garrison because Biran, who fancies himself as a poet, sees opportunities for fame and fortune in the offing. Alas, the king’s plan for a little frolic in the Congo to make his latest floozie its queen collapses when she demurs. She must have been drunk when she agreed to that, she says. So the king sends instead a statue of the Virgin to command the heights (and impose his own religion). Biran has to make do with a Bishop and a journalist-with-a-Kodak as a consolation prize. Into this carnival of grotesqueries comes Chrystostome Liège, a reticent Christlike figure immune to the garrison’s norms. He provokes immediate envy and dislike because he has a superb physique, is an outstanding marksman and doesn’t share the prevailing sense of humour. The obvious way to unman him is to label him effeminate (and worse, using words I don’t care to use here). The officers amuse themselves by requiring him to take on Donatien’s responsibility for inspecting the virgins before Biran’s use. When the schizophrenic womaniser Van Thiegel finds out that contrary to their assumptions Chrystostome has fallen for a beautiful pale-skinned village girl of about fifteen, his revenge is obvious. 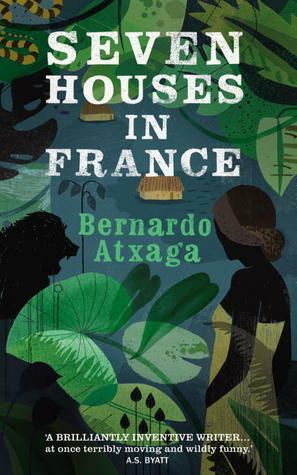 Seven Houses in France is a slim novel of only 250 pages but it has plenty to say about the experience of the colonised. It’s also a jolly good story. Longlisted for the Independent Foreign Fiction Prize, it was, in my opinion, unlucky not to have made the shortlist. For other reviews see Miranda France at The Guardian here and Shadow Independent Foreign Fiction Prize team reviews here. Publisher: Harvill Secker 2011, first published as Zazpi etxe Frantzian in 2009, then as Siete Casas en Francais in 2009. Source: Yarra Libraries by inter-library loan. « ANZ LitLovers is a Best Australian Blogs Finalist! I’m afraid I wasn’t quite as effusive as you on this one. I’ve literally just finished writing my review, and I came to the opposite conclusion – not in my top six. It just fell a bit flat for me, never quite got there (wherever it was going). Tony, you naughty boy, where is the link to this review of yours?! I have just been hunting around all over your blog looking at Round-up no 12 A&B, 11, 10, 9, 8, etc and I can’t find it! I want to add it to my Combined Reviews page!! Please come back and remind me to add it to the list then, won’t you? Hi Stu, he’s certainly one of the most interesting authors I’ve come across. I enjoyed this book,although it only just made my top five I still thoroughly enjoyed the humour in this book. It’s very dark humour, but cunningly clever. I think I would have terrible trouble picking a winner for this prize. This was one of my favourites, and I’ve bought his previous book, Obakakoak, off the back of it. I think it was unlucky not to make the official shortlist, but at least it made ours! Speaking Basque doesn’t make you a nationalist. Atxaga just writes in his mother tongue. Stop politicizing Basque language, please. Comments like yours make it difficult to normalize the use of Basque language. I speak and write Basque too, and I’m neither a Basque nor a Spanish nationalist. Also, I find quite offensive the parallelism established between Christine and Basque women. “Seven Houses in France” is about Western colonialism–all Western countries are responsible for what happened in Africa. I’m sick of the exoticization of Basque culture. It’s just a culture, like any other. Hello Esti, thank you for sharing your opinion. I’m sorry you’re offended by my reference to Christine as the decision-maker in the relationship, it certainly wasn’t intended to suggest that all Basque women are mendacious.